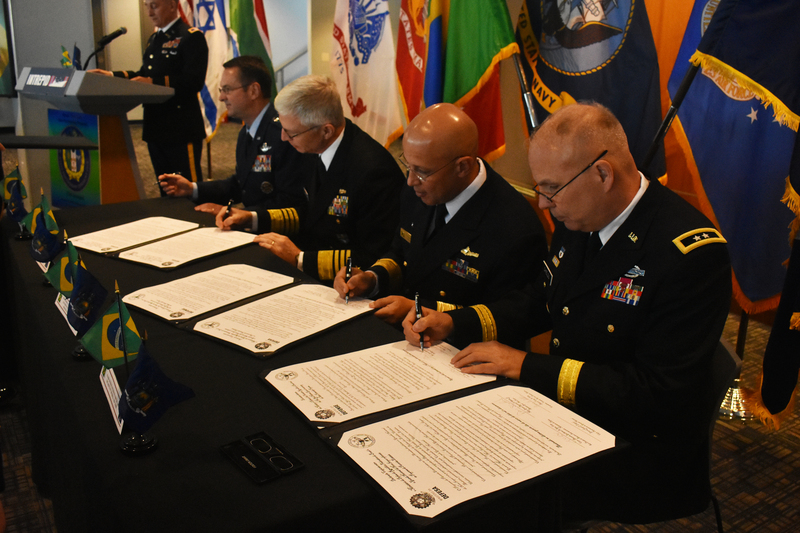 NEW YORK--Chief of International Affairs at the Brazil Ministry of Defense Rear Admiral Guilherme Da Silva Costa(center right) and New York National Guard Adjutant Gen. Maj. Gen. Raymond Shields (right) sign a state partnership agreement on the U.S.S. Intrepid Manhattan N.Y. March 14 2019. Admiral Craig Faller the commander of the United States Southern Command ( center left) and General Joseph Lengyel Chief of the National Guard Bureau (far left) also took part in the signing event. The State Partnership between the New York National Guard and Brazil is a Department of Defense joint security cooperation program executed by the State Adjutants General in support of Combatant Commanders and U.S. Chiefs of Mission to help achieve security cooperation objectives and Department of Defense policy goals.